Operators wishing to wrap small to medium quantities of CD Jewel cases can now achieve a quality finish equal to the standard of more expensive finishing machines, with the CW-CD Jewel Case Wrapper from All Pro Solutions. Polypropylene wrapping material can be supplied in boxes of 10,000 sheets from All Pro Solutions. The result is a professionally folded and sealed CD jewel case suitable for even the best retail presentations and all this for a fraction of the cost of outsourcing. Operators wishing to wrap small to medium quantities of slim line jewel cases can now achieve a quality finish equal to the standard of more expensive finishing machines, with the CW-SL overwrapper from All Pro Solutions. Polypropylene wrapping material can be supplied in boxes of 10,000 sheets from All Pro Solutions. The result is a professionally folded and sealed slim line jewel case suitable for even the best retail presentations and all this for a fraction of the cost of outsourcing. Operators wishing to wrap small to medium quantities of Blu-ray cases can now achieve a quality finish equal to the standard of more expensive finishing machines, with the CW-BD Blu-ray over wrapper from All Pro Solutions. The semi-automatic operation is simple and effective. A pre-cut sheet of polypropylene wrapping material is placed on the manual platform. The Blu-ray case is simply placed on the pre-cut sheet and the operator closes the cover, which tensions the wrapping and makes the first heat-seal. The case is then placed into the hopper for the second fold and seal operation, which is fully automatic. The result is a professionally folded and sealed Blu-ray case. The sealing temperature is electronically controlled and can be set to the desired value. An electronic security system stops the wrapper machine operating in the case of incorrect usage. Polypropylene wrapping material can be supplied in boxes of 10,000 sheets from All Pro Solutions. The result is a professionally folded and sealed Blu-ray case suitable for even the best retail presentations and all this for a fraction of the cost of outsourcing. Operators wishing to wrap small to medium quantities of DVD (Amaray) cases can now achieve a quality finish equal to the standard of more expensive finishing machines, with the CW-DVD DVD case over wrapper from All Pro Solutions. The semi-automatic operation is simple and effective. A pre-cut sheet of polypropylene wrapping material is placed on the manual platform. The DVD case is simply placed on the pre-cut sheet and the operator closes the cover, which tensions the wrapping and makes the first heat-seal. The case is then placed into the hopper for the second fold and seal operation, which is fully automatic. The result is a professionally folded and sealed DVD case. The sealing temperature is electronically controlled and can be set to the desired value. An electronic security system stops the wrapper machine operating in the case of incorrect usage. Polypropylene wrapping material can be supplied in boxes of 10,000 sheets from All Pro Solutions. The result is a professionally folded and sealed DVD case suitable for even the best retail presentations and all this for a fraction of the cost of outsourcing. Now you can overwrap small quantities fast, and inexpensively with the CW-200. Want to start a new business with a small investment? The CW-200 universal wrapper will professionally overwrap any case or box fast for a commercial high quality store bought look. 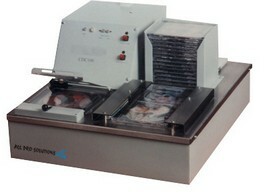 No need to have a second overwrapping machine for another size or type of case! When finished with one size case, quickly and easily change the roll of film and get started with the next case or box! Polypropylene wrapping material can be supplied in rolls from All Pro Solutions for 4800 and 9600 wraps. The result is a professionally folded and sealed case suitable for even the best retail presentations and all this for a fraction of the cost of outsourcing. Now you can overwrap small quantities fast, and inexpensively with the CW-300. Want to start a new business with a small investment? The CW-300 universal wrapper will professionally overwrap any case or box fast for a commercial high quality store bought look. 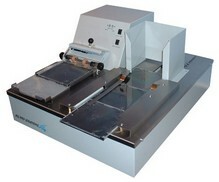 This semiautomatic machine allows you to save more time, because of a higher throughput. All you need to do is make the first seal, put the case in the carriage and move it inside. That's it! Side folds and seals are made automatically (Standard CD Jewel Cases or DVD Amaray Cases). If you need to overwrap other cases - you can do it in manual mode (same as with a manual machine). 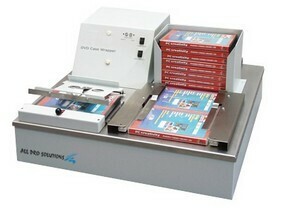 The CW-Speed, is an automated table top over wrapping machine designed for overwrapping CD jewel cases, DVD Amaray cases, Blu-Ray cases or even Nintendo DS case, at high speed with little user intervention. When your output needs the professional edge or simply requires those receiving discs to know they have not been tampered with, wrapping is the ultimate solution. The CW-Speed is an easy to use, cost effective wrapper which provides a neat even case wrap with perfect seams time after time. 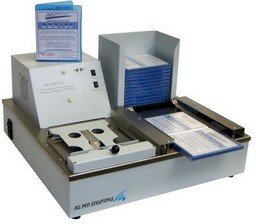 The multi-format CW-Speed is available in CD or DVD case format. But, whichever version of the CW-Speed you choose, it can be easily and quickly converted to accommodate other formats such as Blu-ray and Nintendo DS, with the appropriate conversion kit. Converting between formats takes just 20 minutes. The CW-Speed simply needs a power socket and roll of low-cost wrapping sheet to start wrapping cases. Users place up to 25 cases in the input hopper and press the start button. Once operating, the unit can wrap up to 1200 cases per hour. An optional Upstacker will collect the wrapped media cases and present them in a neat stack or row ready for the operator to lift them from the wrapper in one easy movement, saving the operator valuable time. With the use of the upstacker, a single operator can simultaneously feed the input hopper and remove the wrapped cases quickly and efficiently. 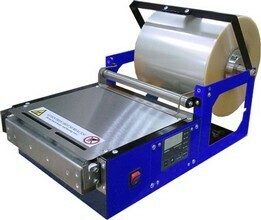 The SpeedWrapper gives a wrapping finish equal to that of CDs and DVDs found in any retail outlet. While shrink wrapping leaves cases with rough, unsightly seams, the SpeedWrapper provides a neatly folded and sealed package. 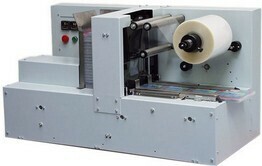 The Speedwrapper allow the user maximum control with sealing temperature being electronically controlled and adjustable. For safety, the unit will stop automatically in the unlikely event of a jam. This protects the user and allows them to efficiently proceed with wrapping disc cases with the minimum of trouble. 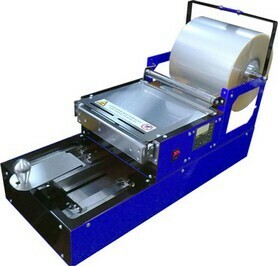 The speedwrapper uses polypropylene rather than cellophane and produces a more professional finish than a shrinkwrapper.